How should I place my studio monitors? When mixing your studio monitor placement can be crucial for true sound. Your main mixing monitors that generally sit by the engineer should be at least 3 feet from where you are and around 3 feet apart from each other. Put the speakers at least that length from where you sit, at a 60° angle apart. Now, play something mono through both speakers (at the same level, so you get a phantom center). 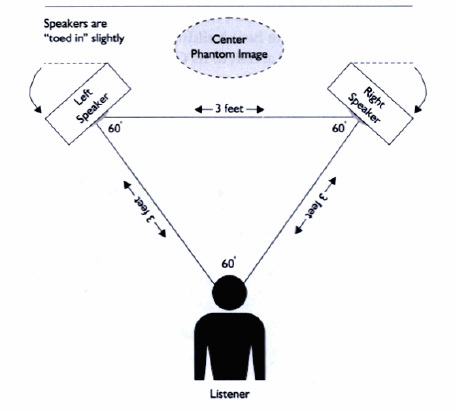 Have a friend push the speakers further apart (from each other) until the phantom center disappears. Now push them back in until the phantom center returns. This a good point at where your near-field speaker monitors should sit. Phantom center is when even though there is no center speaker, vocals should appear to come from precisely between the two speakers.